Imams will come together at East London Mosque on Saturday to speak about the issue of domestic abuse with members of the local community. A panel of male speakers will talk about marriage, about Islam's position on oppression and more unique problems of abuse that can manifest within South Asian communities in the UK. Organisers say the panel is all male to acknowledge that it is far more often women who are victims and they need to target the male perpetrators to send a message that it is not acceptable. It comes after the case of solicitor Mohammed Rahman, from east London, who beat his wife to death after years of violence. Rahman, who worked at the Tower Hamlets Law Centre, was jailed for life in November 2012 for killing Jasmin Chowdhury. He had told her sister by text to remove her "dead body from my flat", the court heard. 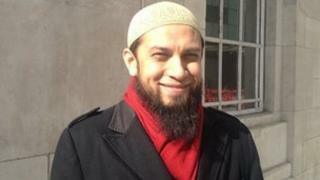 Salman Farsi from London Muslim Centre, where the event will be held, said the case had prompted more action on violence. "It's a really sad and horrific case of where domestic abuse can lead on to something that's really horrendous. This was cold-blooded murder," said Mr Farsi. Speaking at the event will be a number of imams, including 36-year-old Shaikh Shams Ad-Duha Muhammad, who runs the Ebrahim College in Whitechapel, east London. "We called it 'imams against abuse' rather than 'violence' to acknowledge that there is emotional and psychological abuse as well that needs to be addressed," he said. "There is also the abuse where in-laws put too much pressure on daughter-in-laws. "We are looking at all of these different cultural manifestations and phenomena." He added that in the first generation of migrants, from places like Bangladesh - of which there is a large population in east London - there was often a confusion of what was said in Islam and what was sub-continental or Arab culture. He said: "I think if you look at the people who are speaking, we have become imams in the West, we have grown up here, and we are in the unique position of being able to look at what Islam has to say about things like marriage and discuss them objectively." The mosque is also involved in work with the Jagonari Centre in east London - a women's educational resource centre set up by Bangladeshi women. It is targeting men who could be seen as at being risk of carrying out domestic abuse. Nurjahan Khatun, director of the Jagonari Centre, said there were some unique considerations. "There are many social and cultural pressures, some of which may lead women to believe that leaving their husband is wrong, and that if they have been sexually abused they must tolerate it because it is their duty to be obedient," said Mrs Khatun. "The heart of the matter is, according to Women's Aid, two women die every week from domestic abuse. "That's a shocking figure, and we need to highlight it and educate as many people as we can." Put simply, Shaikh Shams says, for him, this work is personal. "I'm married, I have three sisters, and I find it very difficult to come to terms with any man who thinks it's OK to abuse a woman."